Most African safari experiences offer day and night game drives. Most people know what animals you can expect to see by day. However, what animals can you expect to see by night!? 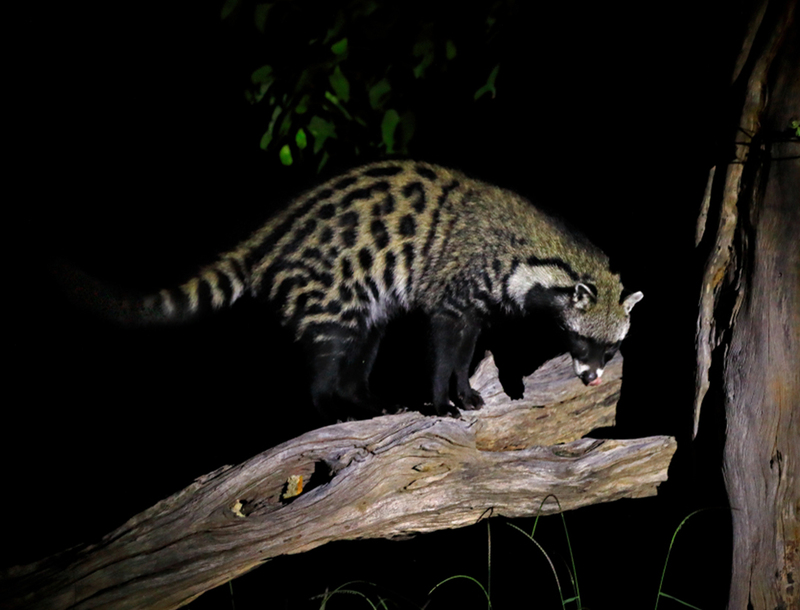 The elusive African Civet is found in the savannahs and forests of southern and central Africa. Weighing an average of 13kg, the African civet is the largest of the African Viverrids. Its body, features dark stripes and patches, with dark horizontal stripes on its hind legs. The mid-section is covered with spots and blotches and the forelimbs often have vertical stripes. The tail is slightly bushy and has black bands with a black tip. The markings on their faces are similar to that of a racoon with a black mask around the eyes. Civets have a short mane along their backs. When they feel excited or threatened, it makes the animal look much larger. You won’t find any civets out during the day, as they are predominantly active before sunrise and just after sunset. The best place to see them is in and around the Kruger National Park where they are seen regularly on night game drives. Virtually hairless, aardvarks look similar to anteaters but surprisingly have no genetic connection to them; astoundingly they are actually from the same mammal family as the African Elephant. They have short necks connected to a large body with an arched back and hind legs longer than their front legs. Similar to anteaters, they have an elongated head with a long protruding snout. Their thick claws on their forefeet allow for them to be able to dig up to 1m in only 15 seconds. They can be found in a range of terrains across Africa, from dry savannahs to rainforests; essentially, wherever there’s an adequate termite supply for food and soft ground like clay or soil for burrowing, there’ll be aardvarks around. Aardvarks are mostly solitary mammals and only come together for mating. While they are nocturnal, you might see them out during the day when they pop out for a little sun. They’re found in southern and most of central Africa. A species of hyena, the Aardwolf is a solitary nocturnal mammal with a diet comprising strictly of termites. Unlike the spotted hyena, the Aardwolf never developed a pack system. This is largely due to the fact that food can’t be brought back to their den; hence why they forage alone. Their dens are usually the disused burrows of aardvarks, porcupines or springhares, however in the absence of such burrows, they are able to dig their own. The Aardwolf’s coast is yellowish brown in colour and features several vertical black stripes. They have a short bushy, black tipped tail and a long, coarse, dark haired mane on its back, which rises when the Aardwolf feels, threatened or scared. You can find the Aardwolf throughout eastern and southern Africa, except in the south along the coast. They prefer semi-arid, open plains, savannahs and grasslands where they live in burrows in the ground. There’s a range of other wildlife you might encounter on a thrilling night game drive including the shy and elusive Leopard, that can be seen during the day, however, are most active hunting during the night. Lions as well are nocturnal hunters; during the day you’re likely to find them sleeping or resting, while at night they’re on the hunt. Experience a whole new side of the African bush, traversing vast landscapes in search of the nocturnal species on an exhilarating night game drive. There’s so much to see and learn about. Be sure to go on at least one night game drive on your next African Safari to witness the wilderness of the African night.